Still playing catch up, so let's dive in shall we? Showing off his skills as a pilot, Lord Vader captures a pirate corvette that is involved in a series of raids. But that isn't the major problem. Instead it's being bossed around by Grand General Taggee (who some might remember as the one voicing concerns about the Death Star's vulnerability before it was destroyed) and an adjutant that is appointed to Vader. It isn't too long before Vader finds the raiders, discovers the traitor in the Empire's midst and keeps his hunt for the x-wing pilot who caused his current situation quiet. In short all in a day's work for a Dark Lord of the Sith. 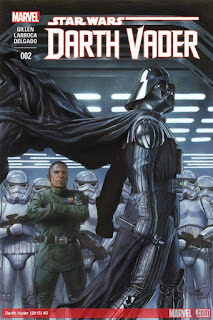 Having enjoyed the first issue, I really dug into this issue since it showed the many facets of Darth Vader-expert fighter pilot, combat general and supreme tactician-along with his way to keep even those who believe they are in charge in their place. All the while writer Kieron Gillen keeps the character compelling without losing his menacing side (which also surfaced in the recent season two premiere of Star Wars: Rebels). In fact this series and the recent animated appearance are helping to reestablish Vader as a frightening villain, not the fallen Jedi (or whiny teen) we saw in the prequels. Also have to give props to artist Salvador Larroca, who captures the looks of the characters and designs from the Star Wars universe with style and a nice sense of layout without losing sight of the story being told. This series is Star Wars in look and feel and Larroca nails that aspect better than some artists have in the past. If you have not dug into this series, give it a shot. This is the Darth Vader you have been looking for. Tomorrow another space adventure comic review so stay tuned. 'Tarzan: Return to Pal-Ul-Don" Coming Soon!